GE appliances provide up-to-date technology and exceptional quality to simplify the way you live. Find versatile cooking features with this 30 in. 5.6 cu. 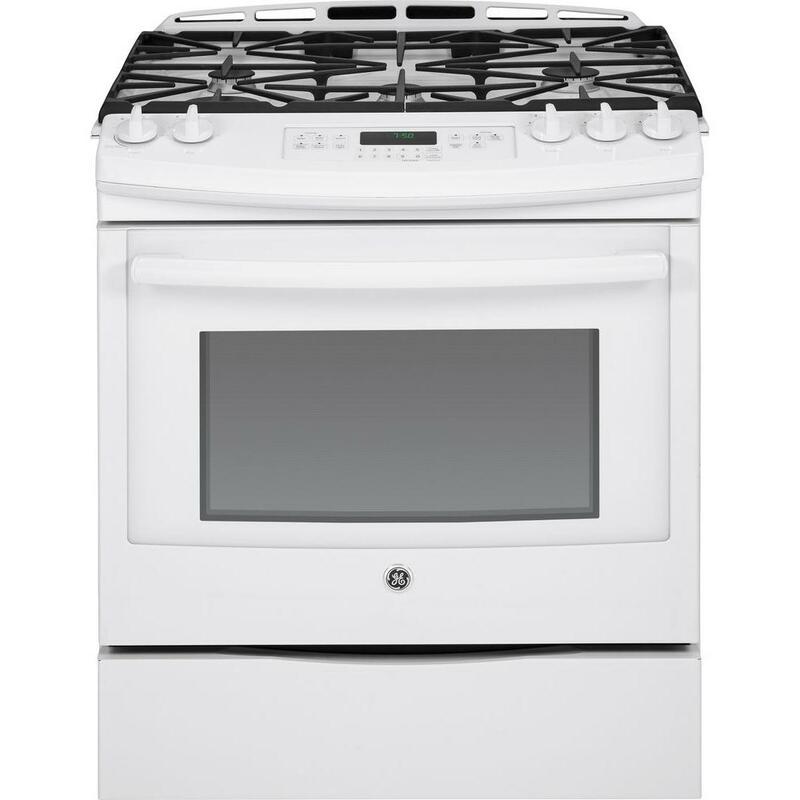 ft. Slide-in Gas Range in White that features convection bake and convection roast, plus a self-cleaning oven. The precise simmer burner allows cooking of delicate foods with low, even heat. The 17,000-BTU power boil burner delivers intense heat for fast boiling. The black gloss oven interior offers a clean and sleek appearance. I can't tell from the pictures, and our local Home Depot stores do not have slate on display. Is the top also slate, or is it black? Also, please confirm the dimensions. In one Home Depot store, the clerk told us this won't fit because our opening is only 30&quot;, stating this model requires 31.5&quot;. At our other local Home Depot, the clerk said, &quot;Of course it will fit. All ovens are standard 30&quot;; it's 31.5&quot; with the slide-in lips.&quot; Clerk #1 was pushing Samsung slide-ins over G.E., since website dimensions say 30&quot; for Samsung. The clerk at the first store that told us it wouldn't fit, also said Home Depot does not install slide-in ranges, only free standing. The other store's clerk said that isn't true. Who's correct and who needs additional training? Clerk #1 said she's sold Home Depot appliances for 16 years, while clerk #2 said 3 years. Thanks! Does this oven need an electrical cord? The stove requires electricity, so yes. can I use a griddle on this? I believe the center burner is small... are there two burners of &quot;equal&quot; btu that would allow for griddle use? Yes, the two right burners are equal in size. The range vents out the top at the back. No need to install any vent pipe. 5.6 cu. 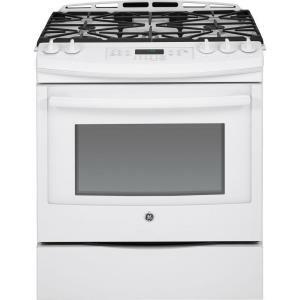 ft. Slide-In Gas Range with Self-Cleaning Convection Oven in White is rated 4.5 out of 5 by 365. Rated 4 out of 5 by Raye1 from Cookin with gas now! I researched gas ranges for about 4 months. I wanted 5 burners, but no oval (a waste of space for this cook), Sealed burners for easy clean up, no bells or whistles (simplicity for me), and in WHITE (extremely hard to find nowadays). I finally found this GE in a Mom and Pop shop. I’m almost completely in love with it. The stove top of the range functions great and is easy to use. The control panel is located in front so it does get in the way when trying to reach the back burners. The oven controls are digital and here’s where it becomes problematic. They are not intuitive, the directions are barebones so you have to figure things out by trial and error. I have not even attempted to use the convection option because I don’t have the time to learn this new skill yet. Setting the timer has similar issues, not intuitive. This range is a workhorse in our home and so far I’m very pleased. Rated 5 out of 5 by jasbstrike from Love it! This is a beautiful oven. i've been using it for about a month now. it cleans up amazingly well for stainless steel. The top grill pattern is very smart and usable. My only complaint is the arrangement of the burners. I simmer more than cook, so I would like a front smaller btu burner. small complaint i know, and i live with it just fine. now for the oven: I love the double broil option. it also cleans up remarkable well. the smart features on this product are very easy to use. i love the convection option as well. I bake at least 5 days a week and have no complaints with how this oven performs. Everything cooks evenly. I found i don't need to adjust baking temps or times for the convection which makes keeping my recipes constant a lot easier. I also like how the edges hang over the counter a bit, i have not dropped one thing between the oven and counter since i got it! The bottom storage drawer slides out easier than any other oven i have ever used. This is a pricey oven on my budget, I even got it on sale, but with my excessive use, so far, I feel it has been worth every penny! Rated 3 out of 5 by Peter from Solid range with ineffective burner layout The range works well. Materials are solid, assembly and finish are good. However, it is needlessly bulky. The area with the knobs and oven controls sticks out more than needed. I would not recommend it for smaller kitchens. Burner controls are solid and precise knobs. Unfortunately, oven controls are all digital and require lots of button presses, even for simple operations such as adjusting oven temperature. My main gripe is with the distribution and layout of the burners. The range has 5 burners: 2 identical small burners, 2 identical large burners, and 1 power burner. - The 2 identical small burners are underpowered. Boiling a small pan of water takes too long. The range would have been more useful with 1 mid-size burner in addition to 1 small burner. - That second small(er) burner should also have been in the back, not in the center of the range. - It would be more practical to have the two larger burners in front, with the power burner in the center. I understand that cooking needs and styles are individual -- but do pay attention to the burner layout and the oven controls before you order this range. Once it is delivered, we found, it cannot be returned. Rated 3 out of 5 by DW from The Range is very nice. It looks great installed in the kitchen. The color is perfect. I only hav... The Range is very nice. It looks great installed in the kitchen. The color is perfect. I only have one complaint the marketing description/brochure list under "Features and Benefits": • Center round burner - Ideal for delicate foods and sauces • Precise simmer burner - Delicate foods don’t burn with low, even heat The range was delivered and installed a week ago and I have not found this "Feature and Benefit to be true. I read and reread the Manuals that were delivered with the range and I went on line and tried to find more details or other information about how to setup and use the range. I finally called the Customer Service Line and asked if I it might have the wrong burner orifices or if there was some way to fine tune the burners' heat output and reduce the BTU output accordingly. I was told that those specifications are only attainable in the testing lab. This is the primary reason for rating the Range as "AVERAGE." Rated 5 out of 5 by Bill from Beach House Stove Absolutely love this stove for my beach house at the NJ shore. Fits perfectly into a 30" opening and has crumb guards on each side that slide over the edges of the counter so nothing slips down the sides. It looks classy and fits right in with the rest of my SS appliances.. FYI, I have a Maytag DW, Frigidaire Refridgerator and Sharp microwave, and you can't tell they are different brands. I have the same GE Cafe model at my primary residence and this one has stronger burners and cooks my oatmeal faster, so beware. The grates are cast iron, and don't scratch and are very heavy, so they feel real solid. I can't say too many good things about it, but I have only owned it for 3 months as of May 2016, so time will tell. . Rated 5 out of 5 by Mamaremodeler from Love 5 times the love OMG is the first thing I want to say. It is sleak, low profile and perfect in my budget french modern kitchen. The 5 burners are amazing and powerful. The oven is more than functional and there is plenty of space in the bottom drawer to hold pans/pots. The other thing I love is that the stove, under the burners, is stainless steel not black. It was easy to install but heavy. It comes with a child proof attachment to the wall. If you open the door hard and quickly the stove slightly tips forward. My only advice is to purchase the stainless steel wipes from Weiman. The stove needs to be cleaned constantly due to smudges and oil spray stain.